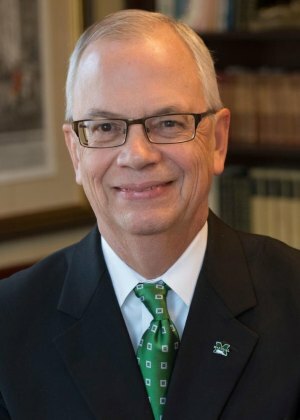 HUNTINGTON, W.Va.- Dr. Jerome A. Gilbert, president of Marshall University, has been named a 2019 recipient of the "Living the Dream Award" in the area of scholarship from the West Virginia Martin Luther King Jr. State Holiday Commission. Gilbert and other winners will be honored Monday during a ceremony at Asbury United Methodist Church in Charleston. The annual event includes a ceremonial walk from the church to the State Capitol Complex for a bell ringing ceremony. In addition to Gilbert, Dr. Shelvy Campbell, assistant dean for diversity and inclusion at the Marshall University Joan C. Edwards School of Medicine, and Maurice Cooley, associate vice president for intercultural affairs, as well as Marshall student Neely Seams, have previously been recognized by the state holiday commission for their work in the area of social change.